I Wonder What It Feels Like To Get Hit By A 188mph Snowball | OhGizmo! By Andrew Liszewski on 10/18/10 • Leave a comment! Like squash, the game of jai alai has players sending a ball towards a wall in an enclosed court. But while squash players use a stringed racket and a rubber ball, jai alai players use a scoop called a xistera to rocket a ball (or pelota) made of metal wire wrapped in goatskin up to speeds of 188mph. The game can actually be quite dangerous if you get hit, so it makes perfect sense that someone would apply the same concepts to snowball fights. This xistera is made from durable ABS plastic and it’s apparently capable of launching a snowball up to 150 feet, which is pretty impressive even if it never reaches 188mph. 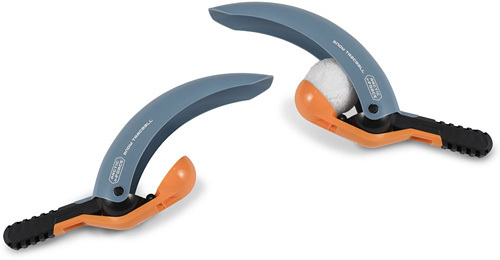 The handle also features a built-in mold for crafting the perfect snowball, and a set of two is available from Hammacher Schlemmer for just $24.95. Goodbye cold and wet gloves, hello concussions.